Why Is This Hatred Different from All Other Hatreds? The commemoration of the holocaust during Yom Hashoah tries to understand a tragedy that defies human comprehension. Some organizations proposing to fight anti-Semitism tend to descend into the mission creep of fighting hatred in general. It is easy but intellectually lazy to group racism, homophobia, and anti-immigration rhetoric into the same category of hatred as anti-Semitism. While any effort to combat hatred in all its forms is admirable, it doesn’t serve to understand the unique nature of anti-Semitism. Not to marginalize the tragedies of so many other large scale violent human tragedies, we should use Yom Hashoah to understand why the Shoah was different. This was a unique event of biblical proportions. This is an event that is on the scale of the exodus from Egypt or the crucifixion of Jesus. It is epic in its nature and will be remembered for millennia. This was not just a case of a one group of people murdering another or a tragic example of the casualties of war. This was a deliberate and meticulously organized campaign from an otherwise civilized people to deny a very specific group of people living in many countries the very right to exist anywhere. They were not destroyed to take their wealth though many took advantage of their misery. They were not destroyed to take their territory, and they were not destroyed for political differences. The Nazis and their many “willing accomplices” wanted them wiped off the face of the earth. 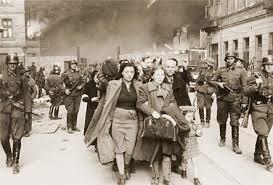 Of the six million Jews killed, only about 500,000 were killed in Germany. This was a pure hatred deeper and wider than any we have ever seen. This is distinctly different from the persecution of the American Indians, who were attacked and marginalized to take their land. It was different from the treatment of African slaves; we did not kidnap slaves from Africa to kill them but to use their labor like that of a common farm animal. Both policies were stains on our history and often brutal and inexcusably inhuman; but distinctly different. Millions of Cambodians were murdered by Pol Pot for political reasons, as were millions of victims of Stalin in Russia and Mao Tse Tong in China. The twentieth century saw a sickeningly high number of genocides, but the hatred behind the holocaust is unique. The scale of this genocide was also unprecedented. One third of the entire population of the world’s Jews was destroyed. Nearly ten percent of Poland’s population, 5,000 villages ceased to exist. Of the six million slaughtered one and a half million were children. This hatred spanned beyond mere nations and leaders. It did not start with Hitler and it did not end with his defeat and death. For two thousand years the Catholic and Christian churches of Europe demonized, marginalized, and ostracized the Jews. In churches followers were taught to believe the most evil lies conceivable about the Jews; that they drank the blood of Christian children as a part of Jewish rituals, that they ate excrement from animals, and that they were sexual deviants, emissaries of the devil. They were pictured with horns and hideously ugly and sinister in the common works of art. Politically the Jews were both needed and despised. The Jews benefited from the rise of capitalism because Christians were banned from lending money at interest. The politically powerful needed the capital they provided to finance their wars and enterprises, but they were hated as part of the social order that destroyed the landed aristocracy of Europe. While the Jews were hated for their role in the rise of capitalism they were also blamed for the rise of communism. This was a statistical fallacy: while a very small per cent of Jews were communists, a much larger percent of communists were Jews. Yet only the Jews could be blamed for both an evil and its opposite. Jews were murdered by the Crusaders on the way to free the Holy Land, they were expelled from Spain in 1492, they were kept in ghettos by the Pope, and they were forced to convert or die during the Spanish Inquisition. In its early history when the Passion Play was performed it incited Christians to burn Jewish villages and murder Jews in their path. The holocaust was not a unique invention of Hitler; this killing field had been nurtured and fertilized by the churches in Europe for two thousand years. Nor was this killing limited to Germany. In fact some of the most brutal and massive killings took place in Russia, Poland, Hungary, Austria, Czechoslovakia, as well as Italy and France. Ordinary citizens in occupied territories took delight in killing their Jewish neighbors: men, women, children, the elderly, and infants. The Nazi soldiers supervising theses public atrocities were often amazed at the brutality of the locals. Even immediately after World War Two, the few survivors of the death camps were often murdered by the remaining inhabitants when they tried to return to their homes. 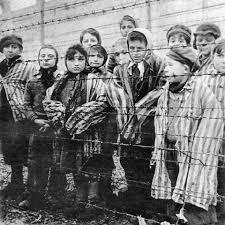 Sadly, the anti Semitism taught to the youth in many of the Muslim nations of the Middle East today is even more violent and hate filled than that experienced before the Holocaust. Today’s anti Semitism in the Middle East would have made the Hitler youth blush. Perhaps the most important point is that it started with words. Ideas have consequences and when repeated enough by people with enough charisma, authority or power the results can be devastating. Whether the words come from published authors, political figures, journalists, intellectuals in our public institutions, or priests from our pulpits, words and ideas can instigate actions that cannot be controlled. Hitler and Henry Ford both believed the publication, “The Protocols of the Elders of Zion.” This proven forgery claims to have been based on secret Jewish plans to control the media, the universities, the banks, and their plan to enslave the world for their own selfish power. It is hard for us to comprehend how anyone can believe such ignorance, but hatred does not need a reason; it only needs an excuse. 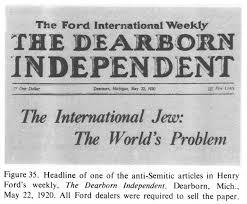 The Protocols became the basis for the anti-Semitic ravings in Mein Kampf and Henry Ford’s “The International Jew”. And today it is widely distributed and believed in almost every Muslim Country in the Middle East. This is why the words of Iranian President Ahmadinejad and so many others, whether on the campuses of our universities, or on the floor of the United Nations, or from school yard bullies cannot be ignored. Our memory is still fresh with the consequences of hateful words and ideas allowed to grow unchallenged. As the survivors and witnesses of the holocaust pass on it is critical that this event be remembered. This is why the numerous Holocaust memorials are important and remembrances such as Yom Hashoah are necessary. In Israel, during the commemoration, they actually read out the name of every holocaust victim publicly out loud: ALL SIX MILLION NAMES. Antisemitism is a virus that mutates to defy every remedy. Otherwise intelligent people rationalize it in many ways. Today many try to veil their anti-Semitism with anti-Zionism, but as Martin Luther King noted there is no difference. When Israel is demonized and ostracized as no other nation for reasons no one else is held accountable for the oldest hatred survives. Sadly this hatred has infected our most respected institutions of higher education. Any success in defeating this hatred requires understanding its differences. But that success may be a key to understanding and defeating the other hatreds and prejudices that plague us.